Every (early) spring I am reminded of why I have a vegetable/herb garden. Between the green garlic, sorrel, parsley, chives, and puny escarole I can flavor most anything and I haven’t actually “gardened” in many months. This is the joy of watching things come up and start afresh with no effort at all. It doesn’t look like much when you scan the muddy patches that I call my garden this time of year. However, we were away for a few days last week and I have yet to do much grocery shopping so we’ve been eating out of the pantry/freezer and the garden and we’ve been eating well. 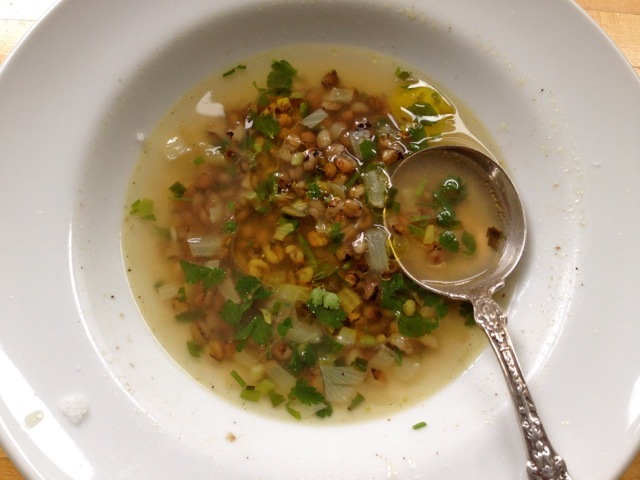 Today’s lunch was a soup of frikeh (scorched green wheat) that I had cooked months ago and frozen, a bit of leftover chicken stock, water, green garlic, a chunk of onion and plenty of parsley and chives and a little squeeze of lemon juice. It took about 10 minutes to make and is just a template for a simple, brothy bowl of soup. Any grain would work and barley or farro would be particularly good. You could skip the grains and just use vegetables or leftover meat but plenty of herbs are key. Use any kind of broth or stock you have or just water. The little bit of lemon juice at the end and the herbs are what stand out here. Saute the onion and green garlic in a bit of oil oil in a medium pot. When softened add the broth and the cooked grains. Bring to a boil. Add the coriander (if using) and stir in the fresh herbs. Salt to taste. Serve with a squeeze of lemon juice and a good drizzle of olive oil. P.S. I’ve created a new section on my subscription-based Seasonal Recipe Collection called What’s for Dinner? It organizes the site by theme such as Creative Salads, Meals that Make Great Leftovers, Prepared Pantry, Kid-friendly Meals and the like. If you haven’t yet subscribed, you might consider it! 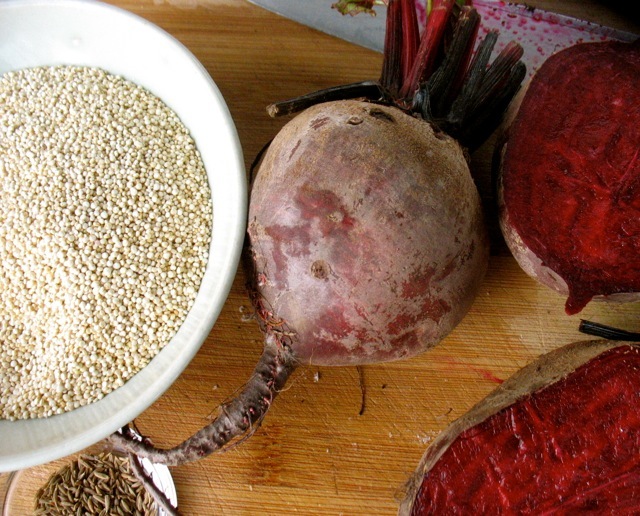 In this recipe raw, grated beets are added to cumin scented quinoa. I have a bit of a funny relationship with beets. I like them and often am attracted to beet-related salads on restaurant menus. They are not, however, the first thing I grab at the farmers’ market. And if I do, they often sit in my crisper longer than most other items. Luckily beets last a long time in the fridge. I have my few go-to recipes for them like this one. And today’s recipe was recommended to me by a trusted friend and I had actually mentally made note of it when I saw it on Culinate.com a few months earlier. 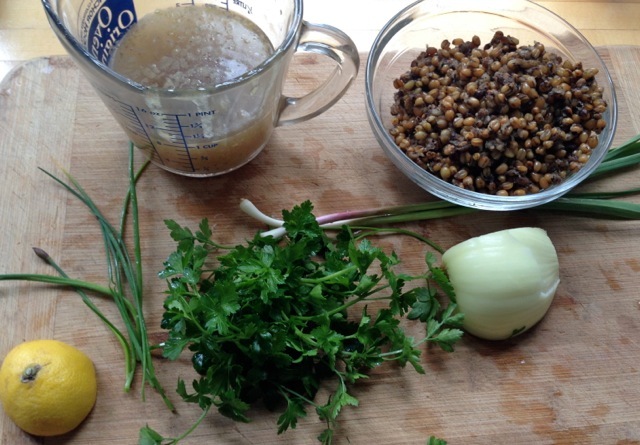 It is a recipe from Maria Speck’s book Ancient Grains for Modern Meals. I taught it in a recent class (Grains and Beans in Winter Salads) and it was a big hit. Be careful when you grate them as the juice flies everywhere and easily stains. I don’t think I had ever used raw, grated beets before making this dish and they are surprisingly sweet this way. In my experience red beets work much better than the golden beets both in flavor and appearance in this dish. (Maria suggests using golden ones as an alternative. ) The dish is quick to make, the color is unbeatable and the balance of the sweet beets, the nutty quinoa, the whole cumin seeds and plenty of lemon juice (and a bit of cayenne) is really, really lovely. And of course the garlicky Greek yogurt topping is the perfect complement. 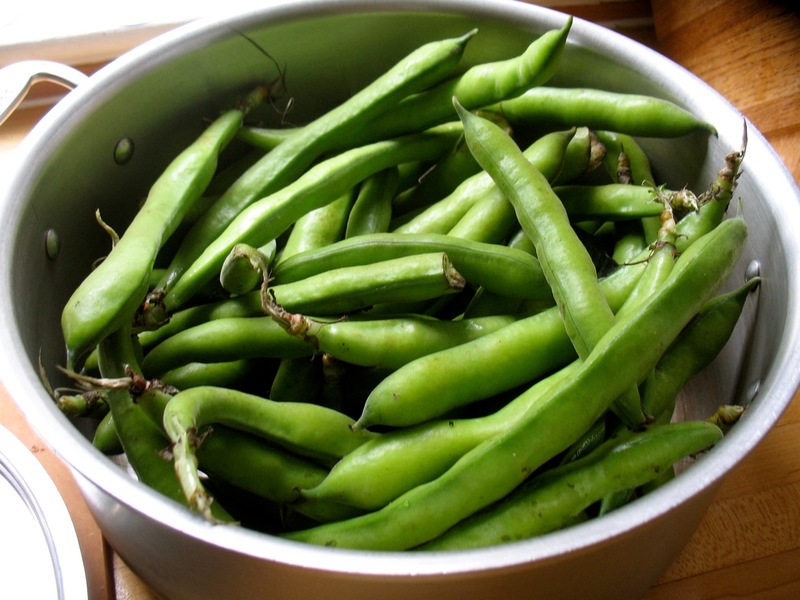 It’s best eaten warm or at room temperature not long after it’s made. I just had some for breakfast this morning right out of the fridge and it was not quite as soft and fragrant so be sure to bring leftovers to room temperature before eating. This would make a lovely addition to any holiday meal. 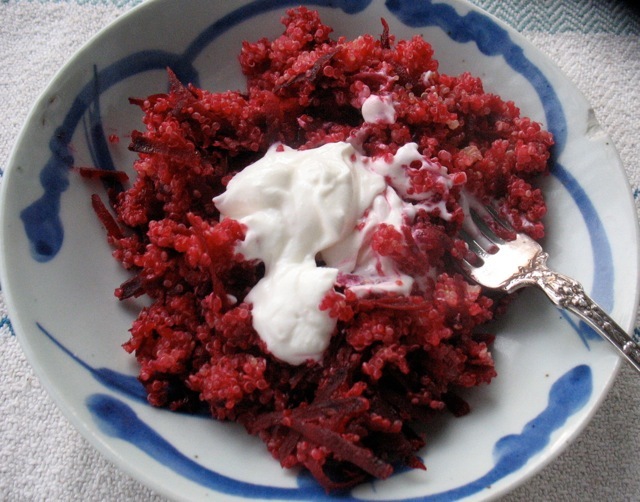 This quick, room temperature dish uses raw, grated beets. The original recipe also calls for sumac, the powder from a red berry found and used all over the Middle East. It has a tart flavor so I substitute a bit of lemon juice (which she also suggests) which works well. Heat the olive oil in a medium saucepan over medium heat until shimmering. 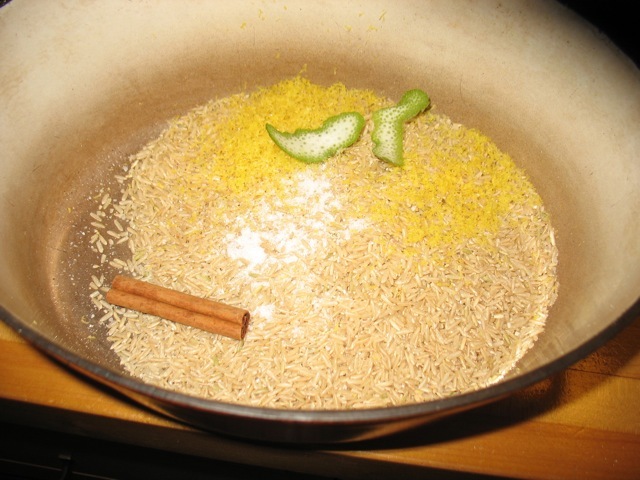 Add the cumin seeds (they will sizzle) and cook, stirring, until the seeds darken and become fragrant, 30 seconds. Stir in the quinoa and cook, stirring frequently, until hot to the touch, about 1 minute. Add the water, salt, and sumac, and bring to a boil. 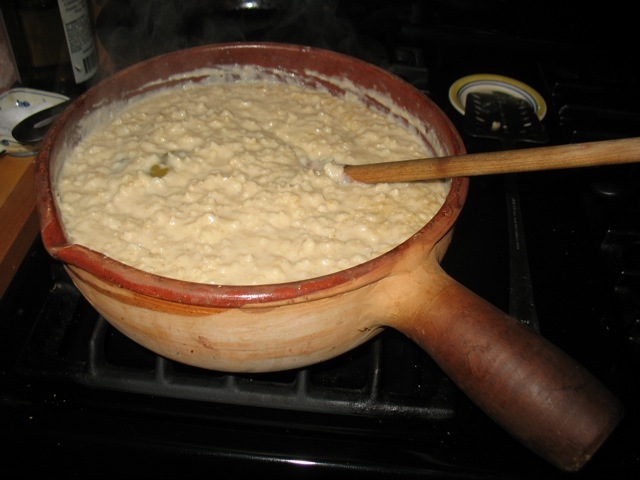 Decrease the temperature to maintain a simmer, cover, and cook until the liquid is absorbed, 15 to 20 minutes. Meanwhile mix the yogurt and the garlic in a small bowl until smooth. Sprinkle with the sumac (if using) and set aside. To finish, remove the saucepan from the heat. 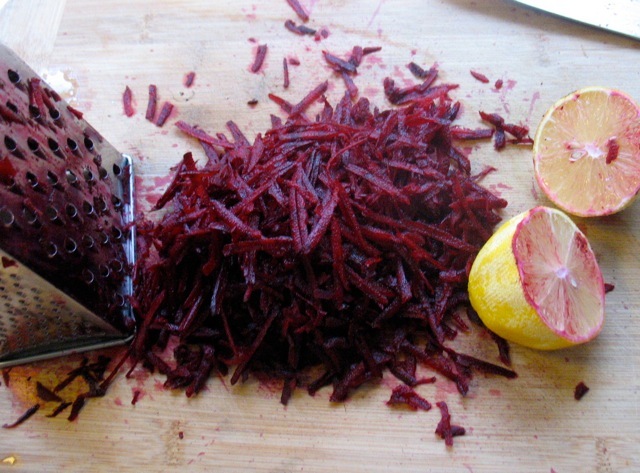 Stir in the shredded beets, cover, and steam for 3 to 5 minutes. Stir in 1 tablespoon of the lemon juice and the cayenne. 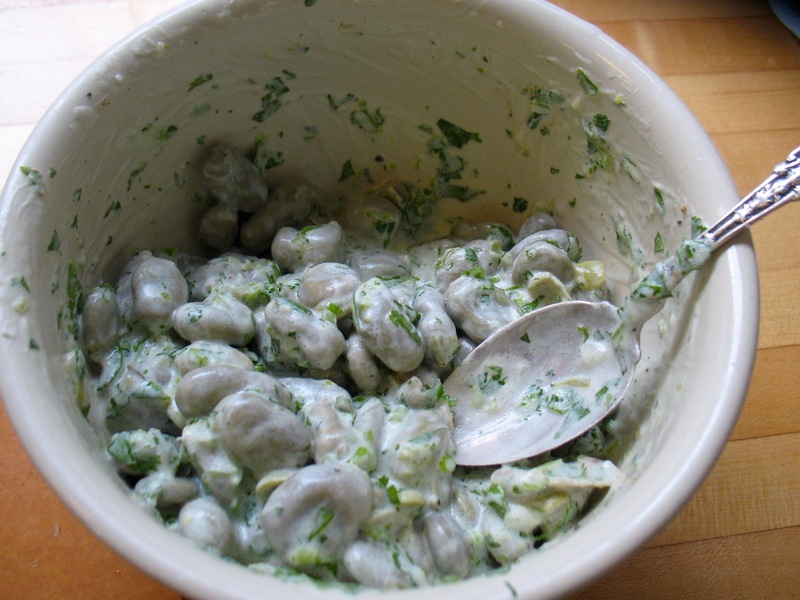 Taste, adjusting for salt and lemon juice, and serve with the yogurt topping. For some reason a lot of sad and tragic things have happened/are happening to people I love right now. And I have that deep, sorrowful feeling of helplessness. When I’m sad I actually have a hard time eating, and an even harder time mustering the energy to cook. So I’m going to get cooking for people and hope that a little warm food might help just a little with the ache of it all. I apologize for the morose post but I guess what is this blog if not personal. This takes a while to make but it’s almost all unattended time in the oven and it’s a treat especially in the winter. You can vary this in many ways to suit your tastes. Mark Bittman suggests pulsing the grains of rice in a food processor a few times to break them up a bit which does result in a more luscious pudding but you can certainly skip the step. Mix all the ingredients well in a 2 or 3 quart oven-proof pot or Dutch oven. Cook uncovered for about 45 minutes then stir well. Cook for another 45 minutes and stir again. The mixture should be bubbling by now and might be getting a bit golden around the edge. Cook for another 30-45 minutes. Now it will start looking more like rice than milk. Stir every 10 minutes now. It will thicken considerably as it cools so take it out just before you think it’s the right thickness. But even if it gets really thick it will taste wonderful so don’t sweat it too much. This was a quadruple batch a while ago, so know that the above recipe will make much less! Send some good vibes out in the world and cook for a friend in need!